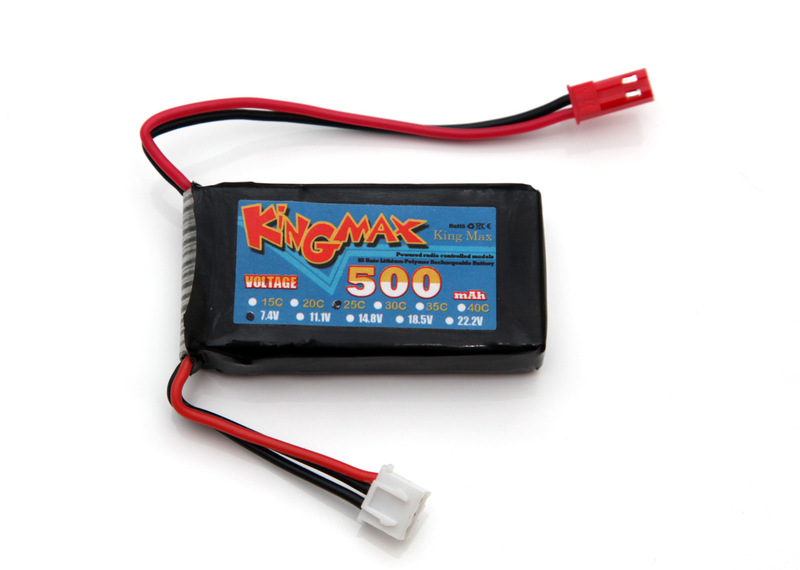 The 2S 7.4V 500 mAh KingMax 25C LiPo batteries are compact packs used for remote controlled models that re supposed to offer decent performance for their small size. The batteries are rated for 25C constant discharge rate and higher burst ones, but are these batteries really capable to deliver such performance? We’ve started testing with a 1C discharge rate (0.5A) and the 2S 7.4V 500 mAh KingMax 25C LiPo battery was able to give out just 438 mAh capacity which was a bit disappointing considering the battery is rated at 500 mAh, this is a little over 12% lower capacity that advertised. Moving to higher discharge rates such as 5C and 10C (5 and 10 times the capacity) the battery handled quite well. At 15C constant discharge rate in the end the temperature of the battery was a bit hot at 55 degrees Celsius (still within acceptable levels) and the capacity provided was already less than half of what the battery could provide at 1C discharge. Moving to 20C discharge rate the battery reached the cutoff voltage very quickly, so the 2S 7.4V 500 mAh KingMax 25C LiPo batteries are definitely not able to handle 25C constant current load when they have trouble even at 20C. In the end 2S 7.4V 500 mAh KingMax 25C LiPo batteries turned out to be a bit of a disappointment with more than 10% lower actual capacity than advertised and not even close to the discharge rates they are supposed to provide. These batteries should have been rated at not more than 440 mAh capacity and discharge rate of 10C-15C and not 25C as they claim to be.